Double glazing can dramatically improve the comfort of a room, home or building by reducing the noise and creating a comfortable, stable indoor temperature. Magnetiteâs retrofit system allows existing windows to be converted to a double glazed system providing the benefits of double glazing without the need to replace the existing windows. The Magnetite retrofit double glazing system has been designed and tested to work with your existing windows, doors, skylights and glass areas. If noise is affecting your quality of sleep or ability to concentrate, Magnetite can help reduce the noise through your window delivering the peace and quiet you deserve. Our double glaze windows can reduce window noise by up to 70%. Whether we are helping you reduce noise or improve your thermal comfort levels, Magnetite windows will reduce the need to crank-up the air conditioner or heater. The ultimate result of our energy efficient windows is reduced energy use and more money in your pocket from savings on energy bills. Magnetite is custom fit on each job to tailor the installation to the shape and style of the existing window. This ensures optimal performance and aesthetics delivering you the solution you are after. Our slim line frame and ability to cut out of square means Magnetite is ideal for heritage and period windows. Our goal is to âexceed our clientâs expectation of comfortâ. This helps us stay focused on ensuring you are comfortable with the entire experience from first contact through to job completion. In addition to our competitive pricing we believe comfort knowing you are dealing with a stable and reliable organisation adds value to the process. Installation of a discreet subframe allows a clear optical grade acrylic panel to attach inside the existing window frame. 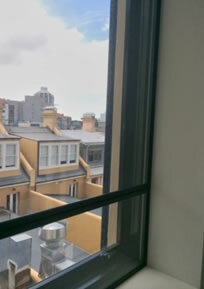 Using continuous magnetic channels ensures a secure and airtight seal around the window. The continuous magnetic seal ensures that when the Magnetite panels are in place the double glaze window insulation system has the lowest air infiltration rate of any operational window. This seal creates an air cavity between the existing window and your Magnetite panels. The acrylic glazing panels used by Magnetite are up to six times more thermally efficient than glass. Solar control films may also be applied to windows requiring reduction in radiant heat. We apply a film to the inside layer of the existing glass. By having the film on the inside of the existing window we are able to reflect the heat before it enters the air cavity for maximum performance. Click here to view Magnetite CAD drawings.